Set in a natural landscape, One Particular Harbour at The Pointe in Nassau Bahamas offers you a unique experience, where you can escape the everyday, relax in luxury, and enjoy the serenity and fun synonymous with Margaritaville. Each of the 126 studio, one-, two-, three-, and four-bedroom residences at One Particular Harbour delivers a distinctive expression of luxury and refined décor. Each residence rewards you with a spectacular, unobstructed ocean view and private balcony overlooking the turquoise waters of the Caribbean. The Pointe features a private deep-water marina designed for the adventurous boating enthusiast, trendy Park Avenue shopping and entertainment, complimentary access to the fun inside our Margaritaville beach resort and waterpark, your personal concierge service, and the convenience to historic downtown Nassau all in one magnificent tropical escape! Imagine having access to the fun at the Margaritaville Beach Resort, drinking in magnificent views of the turquoise Caribbean sea while enjoying a meal at The Pier restaurant. Or walking with your loved ones along the marina boardwalk with luxurious yachts resting at their berths. Swim, splash, tube, and surf at the waterpark at Margaritaville Beach Resort where the fun never stops! You will have access to all of the entertainment that is synonymous with the Margaritaville Beach Resort as a resident owner of One Particular Harbour. Watch the video below to see a rendering of The Pointe, Margaritaville Beach Resort, the Deep-Water Marina, Waterpark, and more. These Elite Residences are Selling Quickly! The Pointe deep-water Marina and Boardwalk will be state-of-the-art and the favorite attraction for both amateur and professional mariners. 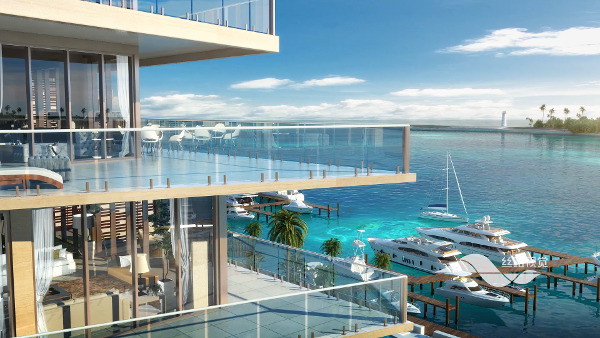 Offering more than luxury berthing across modern floating marina berths, The Pointe Marina and Boardwalk provide a luxurious yachting and marina lifestyle at the heart of Nassau. For those who like to be a bit more active, the Waterpark at Margaritaville Beach Resort, with its family-friendly lazy river and surf simulators, is the perfect way to spend your vacation time. Relax in the Blue Hole, test your surfing skills, navigate the mountainous waterslide, explore the tropical tunnels, and refresh yourself in the cascading waterfall. Your thrilling water adventure awaits! Trendy Shopping, Casual Fine Dining, Entertainment, and More! The Pointe will be a tourist destination at an important address on West Bay Street close to downtown Nassau, taking advantage of the spectacular view of the open waters to the north, the cruise terminal to the northeast, and the historic lighthouse to the northwest. Don't miss this opportunity to own a piece of paradise! One Particular Harbour by Margaritaville residences offer a world of luxury, situated overlooking some of the world’s most spectacular water, in what is considered one of the finest locations in the Caribbean. Whatever your pleasure, you will find entertainment anchored in originality at The Pointe, which turns an ordinary night out into something extraordinary. The Pointe is designed to give our guests the greatest holiday experience they will ever have. People of all ages and cultures can reconnect in a world of splendor, exhilaration and discovery. Don't miss your opportunity to secure your home in the Caribbean sunshine!